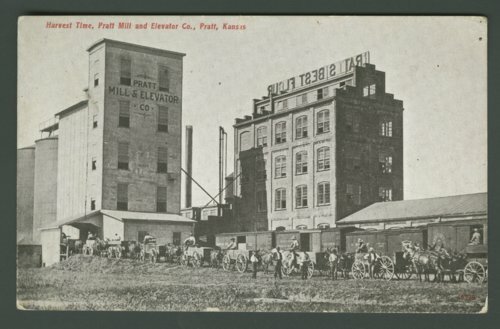 These two images show the Pratt Mill & Elevator Company in Pratt, Kansas. The first image shows a long line of wagons waiting to unload their grain. In the background box cars can be seen. The second photograph shows the front side of the facility and at the top of the building signage for "Pratt's Best Flour" is visible.